Today Eliud Kipchoge of Kenya made marathon history. He officially set a new marathon world record of 2:01:39 in the Berlin Marathon, surpassing Dennis Kimetto’s previous mark of 2:02:57 by an astonishing margin. Whilst many will write long accounts of the race, analysing how the record was set, I will combine all of the best stats and numbers from the race in one place. This will help provide some perspective to the incredible nature of this new marathon world record. So here are the top 10 statistics from Eliud Kipchoge’s new marathon world record! The last time the marathon world record was improved by 1 minute 18 seconds or more was in 1967. This stat comes from Steve Magness who points out that it was over 50 years ago since the marathon world record was eclipsed by such a great margin. This shows the magnitude of Kipchoge’s run, smashing the world record by 1 minute 18 seconds. The last time we saw the men’s marathon record improve by such a significant margin was in 1967 by Derek Clayton. 2:01:39 by @EliudKipchoge is mind blowing. Two athletics world records on the same day. In two different locations. The first time in 62 years. Eliud Kipchoge’s marathon world record was not the only world record of the day. Decathlete Kevin Mayer of France bested Ashton Eaton’s previous record with a new best of 9126 points. Whilst multiple world records have fallen on the same day before, this is the first time that two have gone in two separate locations in 62 years. Two world records were set at two different locations on this day in 1956. – Hungary’s Sandor Rozsnyoi ran 8:35.6 in the steeplechase in Budapest. – Australia’s Betty Cuthbert ran 23.2 for 200m in Sydney. 62 years on, will 16 September 2018 be another day of two world records? Eliud Kipchoge has run a total of 12 marathons with an average time of 2:04:06! Kipchoge’s 12 career marathons come to an average time of 2:04:06. This time alone would be the equal 22nd fastest marathon of all-time, yet this is just his average time. Albeit this calculation does include the Breaking2 test in Monza and the Rio 2016 Olympic marathon which was no more than a jog for Kipchoge. Taking these two marathons out – leaving just the competitive time trials – his average is 2:04:01. From 25km to 30km Kipchoge split 14:21 for 5km. This wasn’t even his fastest 5km split. Mid race, Chris Chavez pointed out that Kipchoge ran a 14:21 split for the 5km between 25km and 30km. This wasn’t the fastest of the race but arguably the most impressive as it was towards the latter end of the race, keeping him well under WR schedule. Eliud Kipchoge’s 25K from 30K to 30K was 14:21! Kipchoge’s first 10km was run in 29:01 which would place him 5th in the UK alone. To put into perspective the pace at which Kipchoge was running, his first 10km (also his slowest) would have ranked him in the top 5 in the British 10km rankings. 29:01 for Kipchoge at 10km. That would put him fifth on this year’s British 10km rankings. The average pace over the last 2.195km was 2:47.6 min/km which is 13:58 5km pace. A big target for many semi-pro or even elite runners is to run under 14 minutes for 5km. Kipchoge was running at this pace over the last part of his marathon world record. Remember, this is after having run 40km at well inside world record pace already! Negative splits are the best way to run a marathon. Kipchoge picked up the second half of the race by 32 seconds. For Kipchoge’s marathon world record, his second half was much faster than his first. This is coming to be seen as the sensible and best way to run a marathon. Only two British men have ever run faster than his second half marathon: Mo Farah and Callum Hawkins. Another negative split. WR. It is not the best way. It is the only way. The last 10km was run in 28:33. Very few can run 28:33, let alone at the end of a marathon. A previous stat about the first 10km of Kipchoge’s marathon world record was impressive. What is even more impressive os how each of 10km splits got faster and faster than the one previous. The last 10km being run in 28:33 which would have placed him 3rd in the UK this year. Kipchoge’s slowest 5km split was 14:37. 14:37 may have been Kipchoge’s slowest 5km split but it would have still ranked him as 6th fastest this year on a Parkrun. His 13:58 pace from 40km to the finish would have put him 1st Britain over a Parkrun course, faster than Alex Yee’s 14:05 lead. 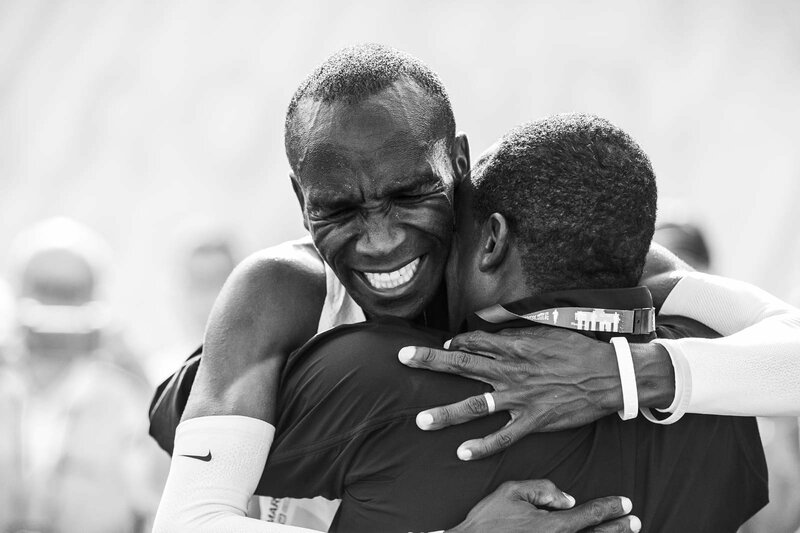 How long could you keep up with Eliud Kipchoge for? Jon Mulkeen has provided this excellent table of pace breakdowns from Kipchoge’s marathon world record. This put into perspective how fast he was going and gives you the opportunity to see how long you would last against him.